Are You Truly Hungry Enough? If your body is asking you for healthy foods like a plate of salmon and veggies, or a bowl of soup, or a big crunchy salad, then chances are you’re genuinely in need of fuel. If none of these food options are ticking your boxes, then go and do something else – you’re not hungry, it’s a craving. Next time you feel hungry, where do you feel it in your body? Y’see true hunger has physiological symptoms – your stomach rumbles, you may experience low energy, or get shaky and light headed. One client told me that she always overeats at meal times because she doesn’t like the feeling of being hungry. Remember, feeling hungry is a good thing, its natural and inevitable, without it you’d be dead! Really listen to the queues your body gives you, then choose something nourishing for your body. True hunger comes on slowly over time, a craving is instant. 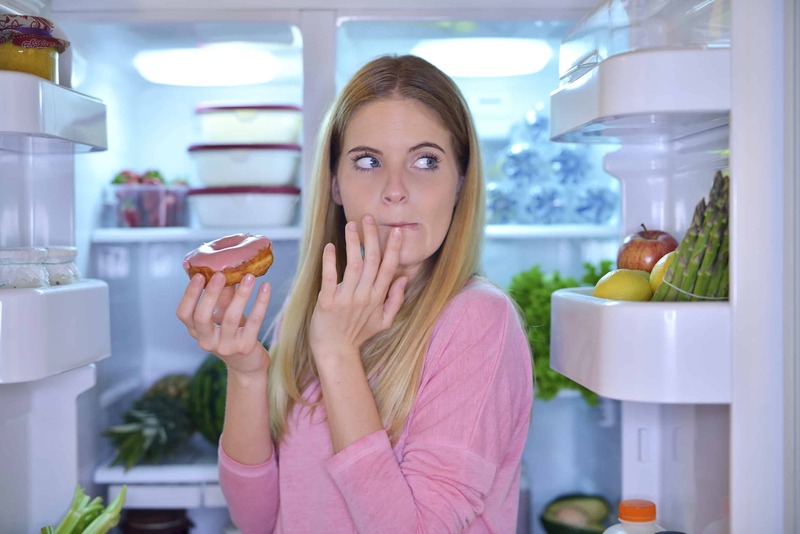 A craving normally wants something high in fat, salt or sugar. If the food you have in mind fits in with this description, you’re not really hungry. A craving is often created by a feeling, an emotional need, a memory, an external trigger – next time you go to eat something that you hadn’t planned for, think back to what lead up to that moment, what was the catalyst. The key to changing the behaviour is recognising the drivers behind the impulses. A craving will pass relatively quickly, especially if you make yourself productive to take your mind off it. True hunger may subside a little for a few minutes, but it the desire to eat will come back stronger the more it’s ignored. Don’t get starving hungry and consequently don’t overeat. Try to use a visual cue like a number, or a scale, don’t wait until you’re at 0 before you eat and don’t overfeed past 8, (10 being fit to burst). Ensure you stay hydrated. If you’re feeling hungry try drinking a glass of water, wait 10-20 minutes then let your body tell you whether it still needs food. One of the main reasons your body will drive you to eat when you’re not hungry is because it’s not getting proper nourishment from the meals you’re eating. Each time you chose to fuel your body, remember to choose nutrient dense natural foods. Meals need to be packed with vitamins and minerals – and the most important vitamin is vitamin ’T’ for TIME. Time is one of the most fundamental nutritional requirements for a healthy body. Eat slowly, chew your food well, minimise external distractions and be present with your food, your body and your soul. Put yourself back in control and give these a go. Wishing you health, success and happiness.